Awards from the PSA—the nation’s oldest poetry organization—are among the most prestigious honors available to poets, offering both emerging and established poets recognition. Young graduated from UC Santa Cruz in 1973 and received his M.F.A. from UC Irvine in 1975. He has taught poetry as a lecturer in creative writing in UCSC’s Literature Department since 2005. Young previously received the Shelley Memorial Award from the Poetry Society of America in 2009. The following year, he was named the first-ever Poet Laureate of Santa Cruz County. 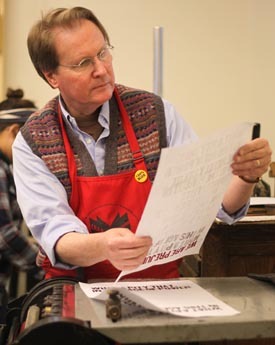 Since 1975, Young has designed, illustrated, and printed limited-edition books and broadsides. His print work is represented in many collections, including the Museum of Modern Art and the Getty Center for the Arts. Because I didn't speak Japanese, they sat me with the children who were talking to a priest. The children asked him questions, and when they laughed, the old man laughed as well. The screens were open to the temple garden on two sides of the hall, and a butterfly, black as the priest's silk robes, flew in and out of view. A trickle of water entered a length of bamboo, which filled and then emptied itself with a hollow chime; was filled and emptied again, so that time was marked by that slow beat. When the priest had finished talking, my friend said, the children were asking him about death, and where children go when they die. The priest told them, if you believe in heaven, you'll go to heaven. If you believe in hell, you'll go to hell. But really, he said, there is no heaven, and no hell, and when children die, they just move from one place to another. The bamboo in the little stream clacked behind us, righted itself, and the water began filling it again. "The restrained, elegant moment captured in this prose poem gradually opens wide for the telling of a huge and unwieldy truth. Without bellowing a moral or drowning in frill, the paced and muted rhythm of the lines brought the setting into stark relief, naming the reader as witness—for weeks after first reading, I couldn't shake the shimmering silence of this poem or turn my back on its echo."